The Utah Department of Transportation (UDOT) approved the braided ramp design for the I-15 Interchange project in Payson. This design includes improvements to the Main Street interchanges; a new interchange 0.7 mi. to the northeast; a new five-lane road (Nebo Beltway) connecting the new interchange to S.R. 198; braided ramps connecting the Main Street and Nebo Beltway interchanges; and widening Main Street to five lanes at the interchange and tapered to its current configuration south of 600 North. This alternative design was chosen over other options due to traffic and it received community support. This option also preserves cultural landmarks in the area, including historic homes on Main Street. UDOT's EIS is available by visiting: udot.utah.gov/paysoneis. The purpose of the project is to improve traffic congestion and accommodate future travel demand. Currently, this project is not funded for final design or construction. 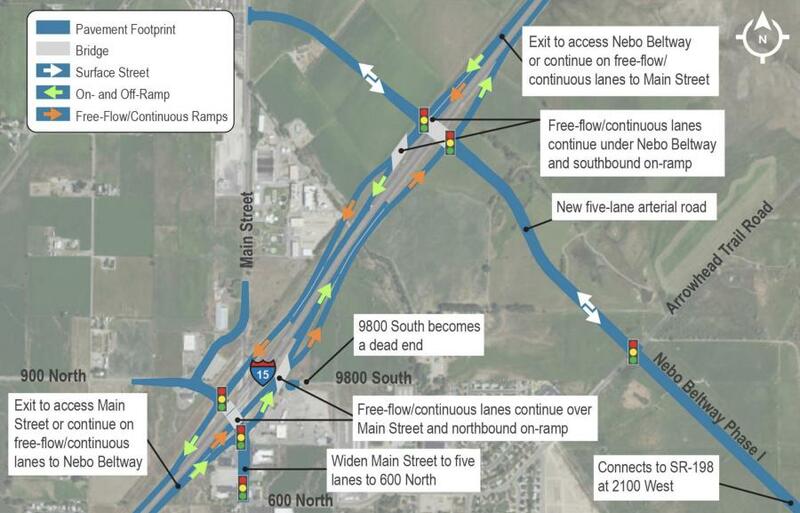 Once funding is available, UDOT can move forward with final design, right-of-way acquisition, and construction.